After Pulp Fiction (1994), I have really fallen in love with Tarantino and his last film which was performed last year but we watched in Spain a few months ago. “Here I am, my baby”, Django tells her lover, and after that, the whole film makes sense again. Western hasn’t been my favorite genre, but it brings me extraordinary memories. When the script is as good as this one and the interpretation is like that… Chapeau. Di Caprio is really brilliant, I think he manages his role perfectly.Too much blood? Quentin Tarantino and too much blood it’s like a indivisible pack, like Won Kar Wai and tenderness, or Hitchcock and his misteriuous wives. Django Unchained, the new film of Tarantino is casting by Jamie Foxx, Leonardo DiCaprio, Christoph Waltz y Samuel L. Jackson. The director has received some awards: Globo de Oro (Best Script) and Waltz has received the best secondary actor. 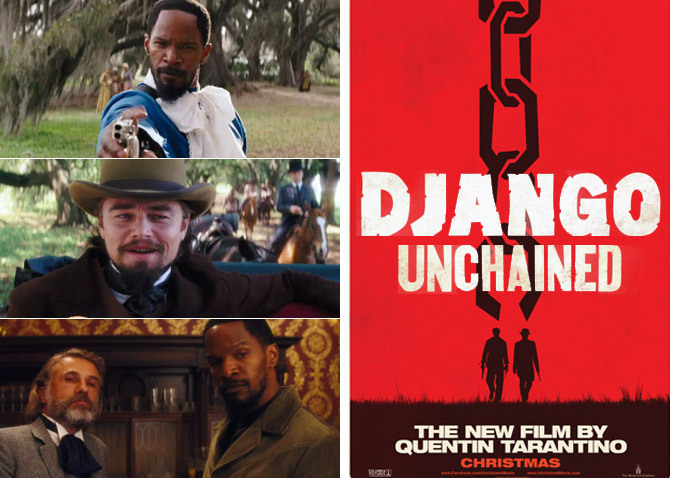 Furthermore, Django Unchained has won in de Oscar’s ceremony 2013 two of the five awards it became to win. (Best Secondary Actor, Waltz, and the Best Script). In 1858, several male slaves are chained and being transported after being purchased by the Speck Brothers, Ace and Dicky, Ace and Dicky. Among the slaves is Django, who has been sold away from his wife, Broomhilda. The Speck brothers encounter Dr. King Schultz, a German dentist and a bounty hunter. Schultz kills Ace after he points a shotgun at Schultz and shoots Dicky’s horse, crushing his leg under it. Schultz then asks Django if he knows the Brittle Brothers and when he finds out that he does and can identify them, Schultz offers Django his freedom and $75 in exchange for helping track them down.